There’s something inside some of us that no matter where you turn it’s there, it drives us and at times it can consume us. It is the fire inside of us and a reason to live. For Bozena Jankowska that special something has always been the environment. When she wrote an essay at school about the Brazilian rainforest who could have known that it would ignite a lifelong commitment to bring environmental and social issues to the forefront of conversation and business practices. When Bozena started her 16 year career in finance, sustainable investing was a relatively new concept. Starting as the one and only ethical analyst at Allianz Global Investors to years later leaving as Head of Environmental, Social and Governance to pursue building her own luxury fashion brand, Bozena had seen the sustainable finance industry completely transform, in part due to her hard work. From investigating cases of cotton plants being pollinated in India by hand, by children in bonded labour, to creating ‘The Ode to the Bee’ collections in partnership with Buglife (using sustainably sourced REACH certified silk and wool from UK based manufacturers) you can see the link between people and the environment is very clear for Bozena. Not being afraid to pick up the phone or visit somewhere and ask difficult questions to get to bottom of underlying issues is a skill that Bozena acquired from working in sustainable finance yet it fits perfectly with building a sustainable fashion brand. We need to feel confident that our choices (of fabrics, factory, distribution, packaging…) don’t have a negative impact on people or the world we live in. The only way we can do this is to research, learn, ask questions, see for ourselves and make a judgement based on evidence and trust. Working in partnership is key for Bozena. A relationship built on trust with both sides knowing what is expected from them is essential. There are not many (if any other!) brands who make-to-order in London with a percentage of sales going to non-governmental organisations. However Bozena has made it possible through forming committed partnerships. 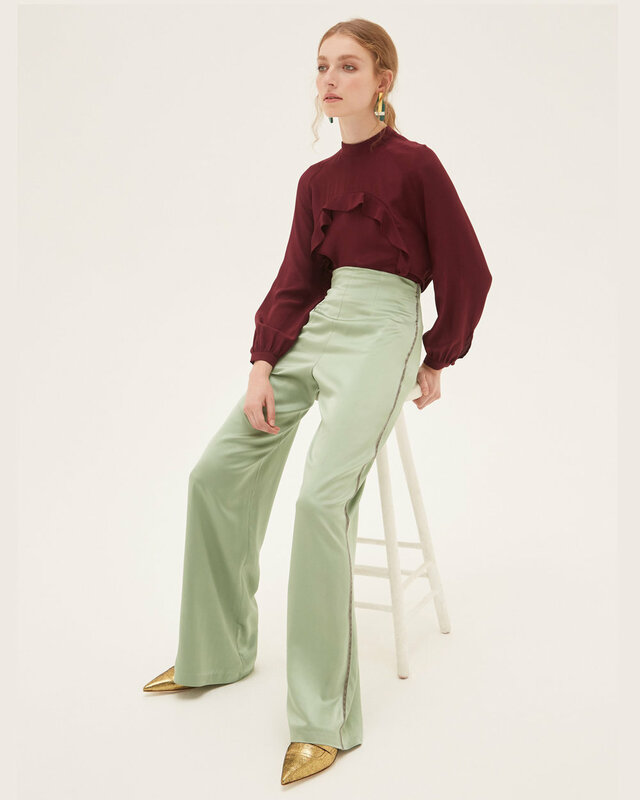 A Positive Luxury ‘Brand to Trust’, Bozena Jankowska’s designs are certainly influenced by her time in the City, as the garments are unique, luxury women’s workwear. As Bozena did with sustainable finance industry she is paving the way forward for a new kind of fashion business, one that has sustainability woven into every part of it. In this podcast we talk to Bozena about how her lifelong commitment to bringing environmental and social issues to the forefront of conversation has created an award-winning luxury fashion brand.